I have been getting quite motivated lately to get some work done on the bike. I have just received some led blinkers. I have ordered the 0-5v hall effect twist grip throttle that should be arriving tomorrow. I have done some more research on Mosfets and IGBT's for the motor controller. At the moment I am leaning toward a 600V IGBT. I am switching 360V which is a little on the high side for mosfets, and there are some quite quick IGBT's. I am about to start the schematic for the motor controller. 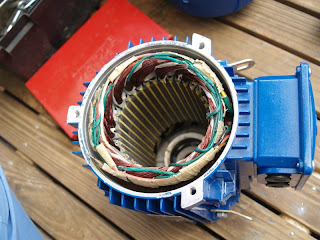 The good news is that I have finally cracked open my 3kw 3 phase induction motor and had a peak at modifying the wiring to half the voltage I need to drive the motor with. I started by cutting the tape holding the wiring together and numbering each slot. The motor is a 4 pole motor with 36 slots. This gives me 12 slots per phase,and each slot is paired to make 6 coils per phase. There are the 6 wires coming into the motor and 9 wires that jump between coils. After writing all this down I then had to work out what it meant and what I have to cut to take the 6 in-series coils in half to get 2 3 in-series coils and run them in parrallel to get half the voltage. I figured out that each phase has 3 slots next to each other and then the next phase has 3, then the next and so on. This give me 4 sets of 3 slots per phase which is where the 4 pole comes from. So I have found the 3 wires I need to cut to halve the voltage. Yay!!! hi bradley, looks like some nice work you are doing! I am planning a bike conversion on a honda cbr125r using a sevcon motor/controller and thundersky batteries however I want to build a honeycomb aluminium subframe and put two wheels at the front like a canam spyder, though I am unsure of the rules with respect to road registering with such modifications (I am in QLD) do you know much about the rules with modifying bikes? Sound like an interesting project. I spoke to a local licensed modified vehicle engineer about the bike conversion and he said as long as the total weight and weight displacement was similar to the original bike and that everything was attached securely and safe then there would be no problems with getting it engineered. For me the power to weight is no problem since the original GSX250F had a top speed of 170kph and the motor reved out to 14000rpm. I am not modifying the frame, wheels, steering or brakes at all. The GSX250F has a cradle frame that went under the motor and up the front which I will be replacing with a battery tray which will use the cradle bolt holes for mounting. The electric motor bolts to the frame using the original mounting points. Because of the size of my motor the chain has to be increasing in size by 3 links. So the engine bay will be filled with batteries and the control gear (and possibly some batteries) will be located under the seat where the petrol tank used to be. I think no matter what you should speak to a local engineer who is qualified to issue a engineers report for registration in QLD before starting the mods. He/she will be able to tell you what you need to do for them to be happy to issue a certificate(Its there business on the line if something goes wrong). The mods you are talking about are fairly significant since they change the whole steering geometry and brakes etc. Motorcycle companies spend lots of money getting each bike they sell engineered and tested. The easiest/cheapest would be to try and stay withing the bikes dimensions and modify as little as possible. Once my bike is running nicely on SLA batteries I will then look into updating to a larger power lithium pack if needed. I hope this helps, and good luck with the conversion. I am interested in seeing how your project progresses. And feel free to ask anymore questions and I will try and answer them to my best ability.